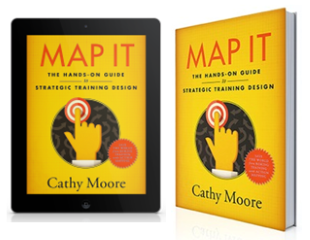 My new book, Map It, is now available in print and Kindle from Amazon sites around the world. Learn more here. 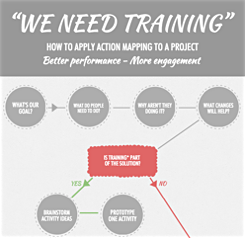 The book walks you through action mapping in way more depth than I’ve been able to use in this blog. You get 418 pages of detailed how-tos, examples, and even scripts for specific things to say (and not say!) to your client. Plus, of course, some gentle snark. You can read a big chunk of the book for free on Amazon by using the “look inside” feature. 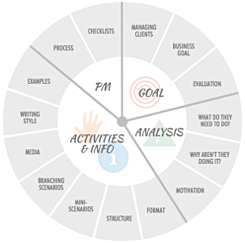 You can also download some action mapping job aids and see activity examples that relate to specific chapters in the book. In the interests of working out loud, here are some advantages I enjoyed from writing a book instead of, say, a series of blog posts. Freedom to dig deep: I enjoyed having the room to write in depth. When you create blog posts, course modules, or those other quick snacks we’re expected to produce, you can feel pressured to simplify too much and smooth over too many rough edges. Expectations for a book are different. For example, I was able to dig way deeper into client management and problem analysis than I’ve been able to go in my other materials. Freedom to take risks: In the book I felt freer to say things that could irk some people, because those statements are surrounded by a ton of context. A blog post or slide in a presentation is easier to misinterpret. I also confirmed a couple of lessons. Reinforce the base before you add any more weight: The book was late in part because I needed to overhaul how I process the many emails I receive. I knew that a book would inspire more emails, and I was already unable to deal with the current amount. This required experimentation with several technical solutions and policies. Thanks, everyone, for your patience while the book slowly crawled out onto the market. I hope you find it useful. I actually have a real paper copy made from good old dead trees with ink on over here in the UK, and I can say the book is brilliant.. Full of excellent guidance and very thought provoking. Written in the unique Cathy Moore style, I am recommending it to everyone in the business of training as a must read. it is really a breath of fresh air in all the pseudo psycho nonsense that is out there. Hannah, thanks for your kind words! I’m glad the book has been helpful. I can’t wait to get your book! 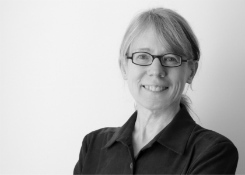 I agree with you 100% about instructional designers analyzing and dsigning. How do I find that job?! Hi Cindy! It’s really unfortunate that our jobs have been increasingly defined as “Do everything from analyzing a complex cultural problem to creating an animated, talking poodle.” When I had actual jobs, I found that the bigger elearning developers (outsourcing firms) were more likely to separate design from production. I could focus on the analysis and design, and a team of much more talented people than I would create the graphics and make everything work. Thank you so much for finally binding your words in a book! Now I can point people to a book that walks them through action mapping end-to-end. I created cards for each obstacle type, and I’m using with clients in the discovery phase. Little tangible things sometimes make a big difference to keep them focused! Zsolt, thanks for your kind words! Your cards sound like a great idea. and your detailed content, job-aids and providing the different scenarios that can occur between stakeholders, SMEs, etc…are priceless. Thank you!! Jeff, thanks for your feedback. I hope the book continues to be helpful.